In the aftermath of Final Crisis, Gotham City is in tatters. With its shadowy guardian presumed dead, the city's criminal element has been energized and mobilized, leaving the remainder of Batman's associates struggling to keep up. 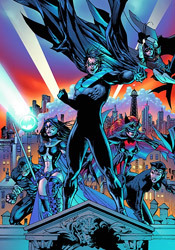 Thus far Nightwing, Robin, Oracle and friends have managed to stem the tide, but a looming showdown between the rival gangs following Two Face and the Penguin, not to mention a diabolical jail break outside the gates of Arkham Asylum, may prove to be too much for any number of heroes to tackle. And that doesn't even account for the in-fighting and conflicting emotions surrounding the very cape and cowl that Bruce made famous. Sadly, despite a steep, heavy-handed narration that tries desperately to instill a sense of gravity and weight to the issue, in the end this goes almost nowhere. While writer / artist Tony Daniel delivers no less than three gigantic giant fireballs, a wrecked Batmobile and a random Singapore cane match between Nightwing and Alfred, so much of the chapter is spent treading water and covering old ground that I was downright begging for some semblance of forward momentum as the final pages trickled by. I have to imagine that the road toward selecting a new Batman involves more than a series of fistfights with nameless, faceless goons and a thin “Imposter Bats” storyline, but this is just a three issue mini-series and that's all the first issue's provided. I was expecting a more proactive stance from these characters, a more animated debate about the positives and negatives of replacing Bruce freaking Wayne, but instead they seem content to just hang back, watch what the enemy is up to and react when the situation demands it. Was Bruce the only one with any balls in this family? If so, who was the character I used to enjoy reading so much in Nightwing a few years ago? This is a rudderless ship right now, steering directly toward a jagged coastline, and the crew seems more interested in staring off into the distance and waiting for a new captain to announce himself than turning the wheel themselves. Daniel's artwork isn't the worst DC has to offer, but it also isn't the best. While his work has improved notably since our paths first crossed during his brief run on Spawn, it's also become much more generic. His linework is tighter, more refined, more detailed, but the poses his heroes strike and the constant scowls they wear come straight from the book of overused superhero clichés. The constant overlap between panels may help his work to stand out, but it also tends to be confusing and unnervingly busy, particularly during the fight scenes. On the few occasions Daniel's story slows down enough to allow for a quiet panel or two, it forces so much onto the page that the fleeting moment is lost. I don't hate the way this series looks, but I certainly don't love it, either. Try as the publisher might to convince me Battle for the Cowl is a landmark event on par with The Death of Superman, in the end it's really much closer to that story's meager follow-up; The Reign of the Supermen. While this issue offers plenty of acceptable choices for the role of Bruce Wayne's immediate successor, it does nothing to get me excited about a single one of them, nor does it convince me any are ready or even willing to accept the responsibility. At the end of the day I was left thinking the best possible outcome would be a sudden, suspiciously explained return from the grave and an abrupt return to the status quo. Which, come to think of it, is precisely how Reign of the Supermen ended. This is a lot of hot air. Flip through it if you're curious and want to stay current, but don't let the publicity take you for a ride.